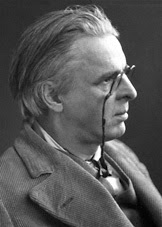 William Butler Yeats was both a poet and a dramatist. Born in Dublin in 1865, he was awarded the Nobel Prize in Literature in 1923. Unlike many award winners, his greatest works were actually completed after winning the Nobel with collections of The Tower(1928) and The Winding Stair and Other Poems (1933). The poem "Death" was published in The Winding Stair and Other Poems. It was actually written in reaction to the assassination of his political friend Kevin O'Higgins, which is referenced in the later part of the poem. What I really like about W.B. Yeats is that I have to reread his poems a few times to really grasp what he's trying to say. The sentiment in the first part of the poem is that simple profound truth; that we as humans, unlike other animals, are cognizant of our own mortality. As far as we know, birds are not flitting around the sky worrying about death, or even experiencing hope for the future. It is this fact that allows us the material we write about in this blog. People contemplating death and grief give us music, art, poetry, books, etc. There are many symbolic deaths we go through in life, only to rise again and continue. Although the last portion is in direct relation to his friend, it relates to the inescapable nature of dying. Mr O'Higgins had played a role in the executions of some IRA members, his assassination being in retaliation to this. He said to his wife, "Nobody can expect to live who has done what I've done." The image of a man looking head on towards certain death, in fact casting scorn at the idea of avoiding or replacing death (casts derision upon/ supersession of breath), may be a maturing from the initial feeling of dread at dying or hope to avoid it seen in the beginning of the poem. As for the last line that "Man has created death", it's often quoted out of context from the poem. There are two thoughts I have for this. The first, when thought of with the beginning idea of the poem, that animals are unaware of their own mortality, well then it is we, "man" by our own awareness of dying that indeed we have created the concept of "death". Second, he simply could be referring to his friend Mr. O'Higgins, who by his own admittance, undertook actions that led to his death, thus perhaps he actually "created" his own death? "man has created death" - the concept of death is the concept of non-existence. We haven't created this via recognising that this occurs and will occur to us, anymore than we create the finite span of the Earth to sustain life by becoming aware of it. If this is the interpretation then we can say that good poetry and fautly reasoning, or poor philosophy, abound. Good points but I think it would be fair to say, that in the act of discovery we create the context and biases of the newly discovered object. And I never let faulty reasoning get in the way of good poetry! I am not sure what you mean when you say we create the context or biases of the newly discovered object - in this case our own mortality. Can you elaborate a bit on this. I agree that good poetry and faulty reasoning are compatible but I have greater admiration for poetry that makes sound philosophical points, or reflective points, whilst also having poetic merit. On this note I at tempted to read Yeat's comment "He knows death to the bone, man has created death" as referring to the knowledge of death creating a fear within us, that can produce an effect like death, a kind of mini death of the person, of who we once were, or hoped to be". This is my own bias towards reading the poem, and avoids attributing to Yeats any blunder or confusion in thinking.